Executive Lunch Buffet At Rs. 143 Only is an event that took place between 22-Oct-2005 and 30-Jun-2007 in Hyderabad. There is Hyderabadi Khana and there is Khana loved by Hyderabad. The latter is a melange of cuisines from all over the world, garnished liberally with spices from the very interior of Andhra. Rang gives you a sumptuous spread of all things yummy, at its thoughtfully planned Executive Lunch Buffet. It comes for only Rs. 143 and includes the most delectable, tongue-igniting dishes from every corner of the world. Rang’s buffet starts with veg. and non-veg. soups and starters, followed by a massive main course cuisine. There are rotis, butter naans, rumali rotis, veg. curry, paneer curry, dal, sambar, rasam, plain rice, jeera rice/lemon rice/veg. fried rice, noodles. veg. in hot garlic sauce, veg. manchuria/gobi manchuria, chicken/mutton, fish pulusu, goan fish curry, mutton masala/mutton roghan josh/prawns masala, green salad, cucumber salad, tossed salad, curd-rice, papads and pickles. As dessert, you get vannila ice-cream plus one sweet dish which could be anything, whether Semiya Payasam, Kaju Kheer, Qubani Ka Meetha or Double Ka Meetha. Be the first to comment on Executive Lunch Buffet At Rs. 143 Only! Just use the simple form below. fullhyd.com has 700,000+ monthly visits. 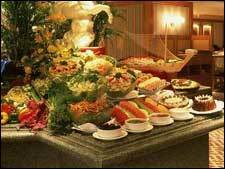 Tell Hyderabad what you feel about Executive Lunch Buffet At Rs. 143 Only!